Having seen a lot of ‘top 10 lists of 2009’ around, we thought we’d throw in our two cents and give you the top 10 most read articles on Mendeley, published in 2009! 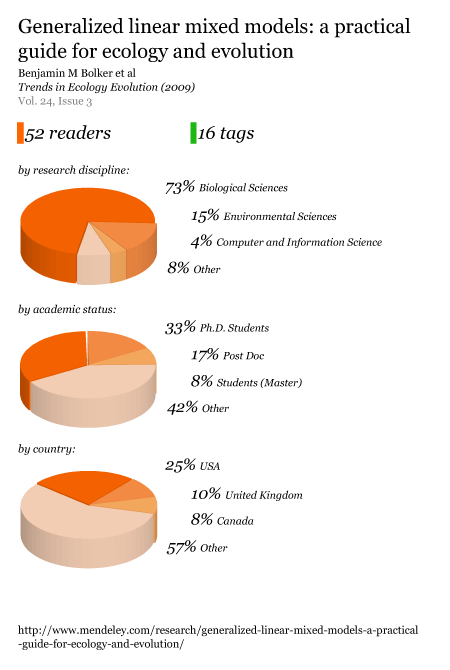 The top paper for 2009 was written by Uri Alon, entitled: ‘How to choose a good scientific problem’, published in the journal “Molecular Cell.” Our stats tell us that there are currently 74 Mendeley users who have read this paper, even though it was only published in late 2009. 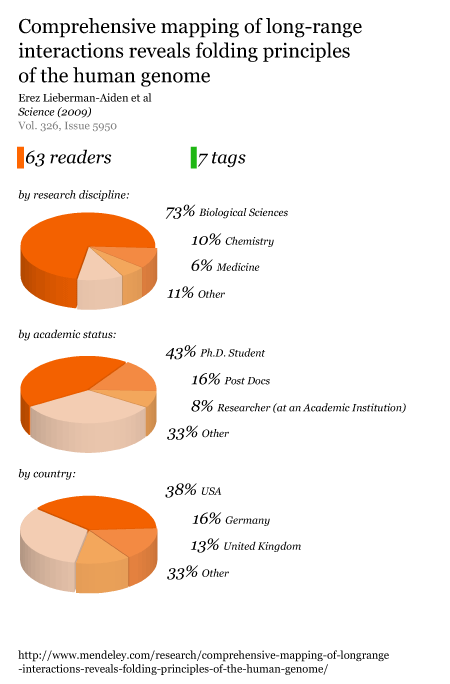 We’d like to point out that this isn’t an authoritative list of all the ‘most read articles for 2009’. Instead, these are the ones that appear in Mendeley user libraries and show some early indications of the popularity of a journal article. We will also track the evolution of these stats over the course of 2010. With Mendeley’s growing user base, the readership count can complement other measures, such as citation metrics, adding an extra dimension to assessing a journal article’s impact. 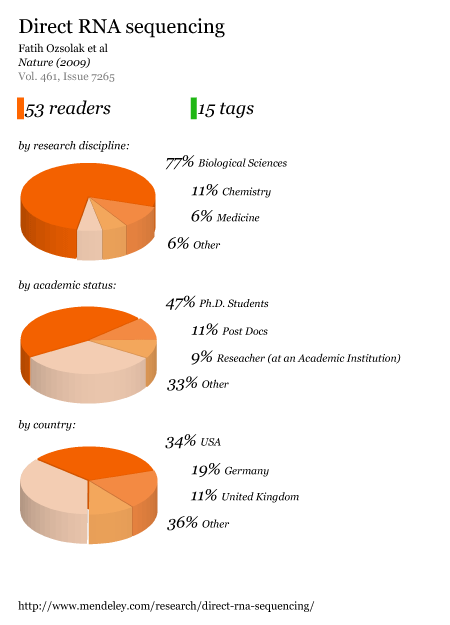 For example, the article “How to choose a good scientific problem” is a general interest article, rather than being specific to biology which suggests it is not likely to have a high citation count in future primary research literature. 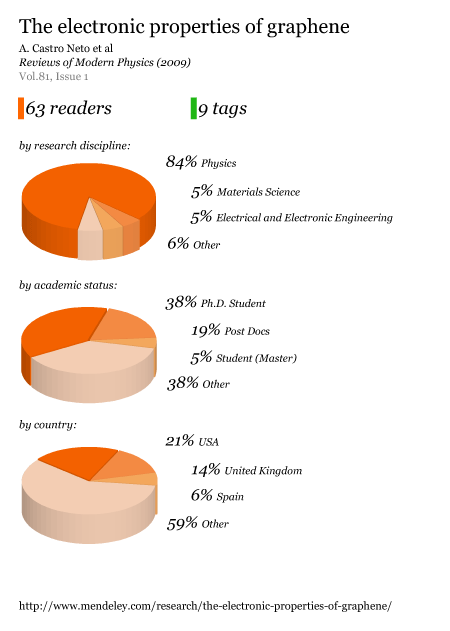 Nonetheless, it is already the most read paper on Mendeley published in 2009, a factor that would otherwise be missed. 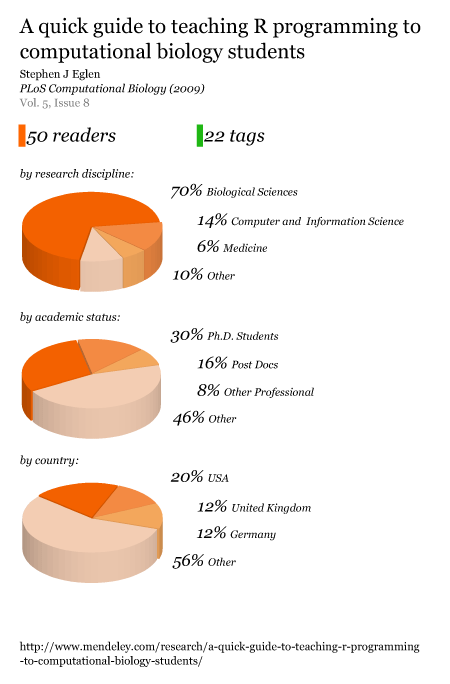 This indicates that the readership count can allude to other ways in which articles are used within a community, and therefore increase awareness of what should be read. The next step will be to anonymously track reading time and quality rating metrics to gather the most accurate data possible for our upcoming personalized recommendation engine. Understanding and predicting research trends is an important part of research. 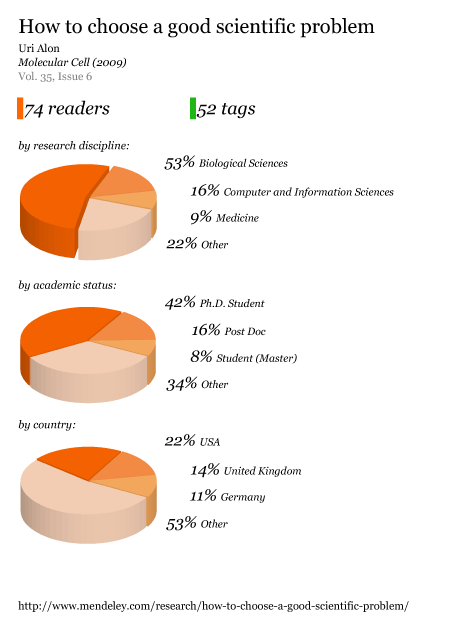 The citation count, used for decades as the gold standard in article-level metrics, can verify broad trends occurring within academic disciplines such as biology. 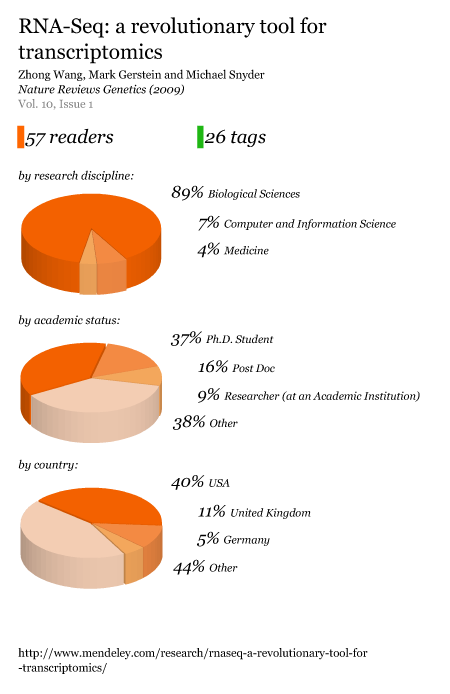 While quite accurate, official citation metrics take two years to calculate. In contrast, readership statistics may be able to predict similar trends in real-time. We look forward to comparing the top 10 list shown above to the official ISI citation metrics for 2009 publications when they are calculated and released later in 2010 or 2011. 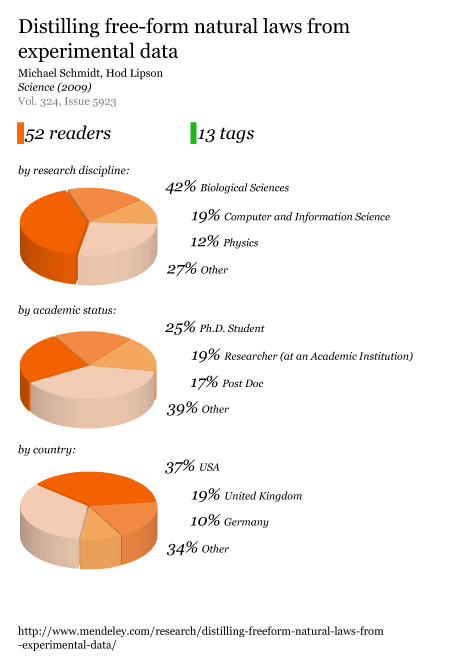 In summary, using Mendeley’s readership figures alongside the citation metrics should make it possible in the future to evaluate the scope of a journal article within the community more effectively. 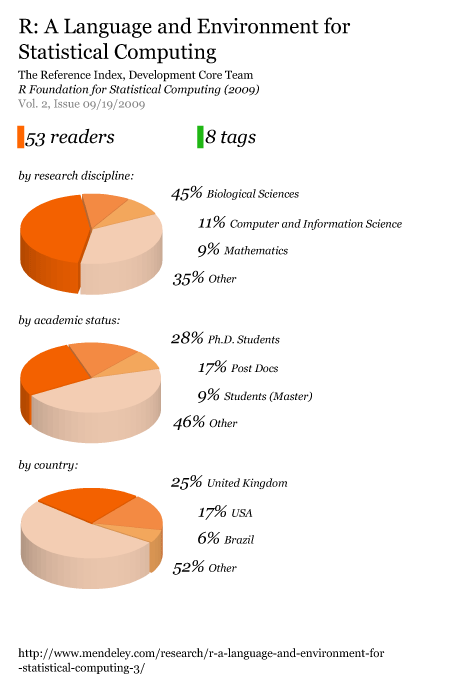 Finally, further refinements and understanding of readership metrics might make it possible to identify the next big trend in the academic world. 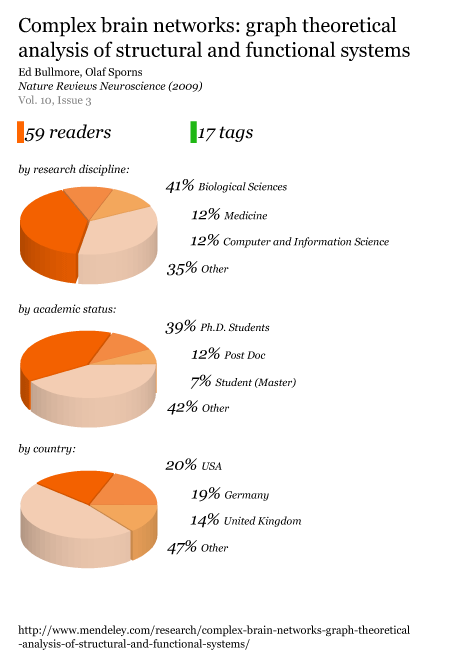 The top 10 list was made by noting how many times a paper appears in the libraries of individual Mendeley users (readership count) and how many distinct user tags were attributed to that paper (tag count), then we filtered the results to include only papers from 2009 – done! Some may have already heard the news that 2collab, a product of Elsevier, is no longer accepting new users and will be shutting down in due time (updated). 2collab and Scopus Product Manager, Michael Habib, announced this on January 16th at the Science Online conference in Raleigh, North Carolina. Seeking to provide a reading list alternative for their 2collab users, it was also announced at Science Online that Mendeley was chosen to enable the opt-in transfer of any 2collab public library folders. 1) If you are a 2collab user and do not have a Mendeley account you will first need to sign up here for free. 2) Once registered or for those already registered on Mendeley, go to the ‘Accounts’ link located at the top of the Dashboard page after signing into Mendeley.com. 3) At the bottom of the accounts page you will see a form for entering your 2collab username details. 4) Your public folders will be imported and the next time you open or sync the Mendeley desktop software those folders will be visible. They will also be available on the Web at Mendeley.com and can be viewed by proceeding to the ‘Library’ page. 5) Within the Mendeley desktop, you will then have the option to turn those folders into ‘public collections’ so that others can continue to stay up to date with what you are reading via RSS and other means. For example, here is a feed on Norovirus. Please contact 2collab if you need any help specific to 2collab. We wish the 2collab team the best and know that they are already working on some great stuff at Scopus and elsewhere. We are very happy to announce that CAT.INIST, one of Europe’s largest scientific research catalogs, has added Mendeley’s ‘easy import button’ to its article pages. CAT INIST joins the Public Library of Science (PLoS) and ArXiv.org who have also added Mendeley’s import button to their article pages. CNRS, “Centre National del la Recherche Scientifique” (the French National Research Institute), provides research articles and information for scientists and academics Europe-wide. The cooperation now allows users to quickly import articles to their Mendeley online library. Additionally, by installing Mendeley’s Web Importer into your browser, you can easily import articles from many other databases as well, such as Google Scholar, PubMed, IEEE, ISI Web of Knowledge, etc. For a complete list of supported websites, have a look at http://www.mendeley.com/import. For more information on CNRS’ catalog visit http://cat.inist.fr. Great news! We’ve been picked by Chinwag and the UKTI to don our cowboy boots and Stetson hat before jetting off to the great Lone Star State on a Digital Mission. There are some great presentations in the line-up at SXSWi, some of the ones we’ll be looking out for include: Can the Real-Time Web be Realized? ; Crowd Sourcing Innovative Social Change and Is The Brain The Ultimate Computer Interface? We also hope to swot up on doing business in the US (not by watching re-runs of Dallas) but attending some special events and seminars set up for tech entrepreneurs. SXSWi brings together some of the brightest minds in the tech world and a line up of special programs showcasing websites, video games and start-up ideas. If you are planning to attend, let us know and we’ll be happy to hook up. A big thanks to Digital Mission for making it possible and we’re looking forward to a great event! And as the team arrives back in dribs and drabs following their holidays, here’s one more piece of news we’d like to share with you.